Microsoft Office 365 (Office 2013) just launched the other day and while users are still getting used to it, there’s one feature that hasn’t received much attention, and that’s apps! Within the Microsoft Office apps, you can actually access and download apps within those apps, sort of like plugins. At launch, there are about 200 apps available to integrate into Office. To browse the apps, you can go here in your browser, or within Word (or another Office app), go to the Insert tab and click on an icon that says Apps for Office. A dropdown offers quick access to recently used apps. Hitting “see all” in the drop down opens a window where users can choose from apps they’ve downloaded, view featured apps, or visit the Word app store in the browser. 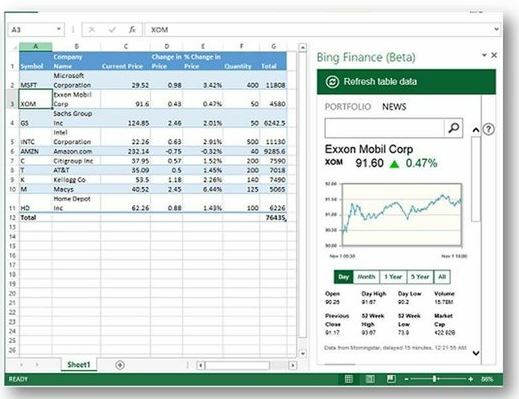 Bing Finance (Beta) for Office helps you take control of your finances by letting you build a finance portfolio table in Excel. You can input stock symbols and customize the fields you’d like to display by selecting from a wide range of data columns, including current price and news. Bing News Search for Office lets you search for news and related videos from within a Word document. Bing search results can be inserted into the document by clicking on the insert plus icon. You can also add frequent searches to your favorites list. Bing Dictionary (English) for Office continuously discovers and distills high quality language knowledge so you have the latest definitions and spellings available. Aren’t sure of how to spell something? Simply enter words as they sound and Bing can suggest letters, words or phrases, optionally specified by part-of-speech. Bing Image Search for Office allows you to search for images on the web from within your Word document. You can search for images by selecting text in the document or typing in the search box. Results are displayed in a grid and when you click on a result, a larger preview is displayed at the bottom with additional details and options. Any result can be inserted into the document at the location of your cursor by clicking on the insert plus icon. When one person uses an app and sends the file to another person, the recipient gets the app too. It’s then up to the developer how to handle the new user. If it’s a paid app, the developer can opt to give the new user a 30 day trial or display a screen where the user can buy it immediately. For IT admins, Microsoft has included some controls and used an architecture for the apps designed to avoid potential problems. Administrators can turn off the public store so employees can’t download apps from it. They can also create a company store, populating it with suggested apps for workers. IT admins can then run reports to see which workers are using which apps and if certain apps are crashing often.